30th December 2014 : Melbourne to Sydney – George’s apartment in Surrey Hills that we found through an intense search on Airbnb, was close to the CBD. Trust me, that is all one needs – an affordable (100 – 150$ over budget is called affordable during this time of the year) place to crash after New Year fireworks. A place that doesn’t wring your pockets dry and is not in the back of beyond taking 5 hours to reach*. Dumping our luggage in the room, we venture out for sightseeing. Serendipity strikes. Spotting a woman wearing a neon green ‘I’m Free’ lettered T-shirt ( That was Justine, co-founder of I’m free walking tours) circled by about thirty people, right out side QVB, near the talking dog statue, we join her. And what follows is a peek into the city’s history and a walk past Sydney’s major sights described in a fun, extremely informative narrative. 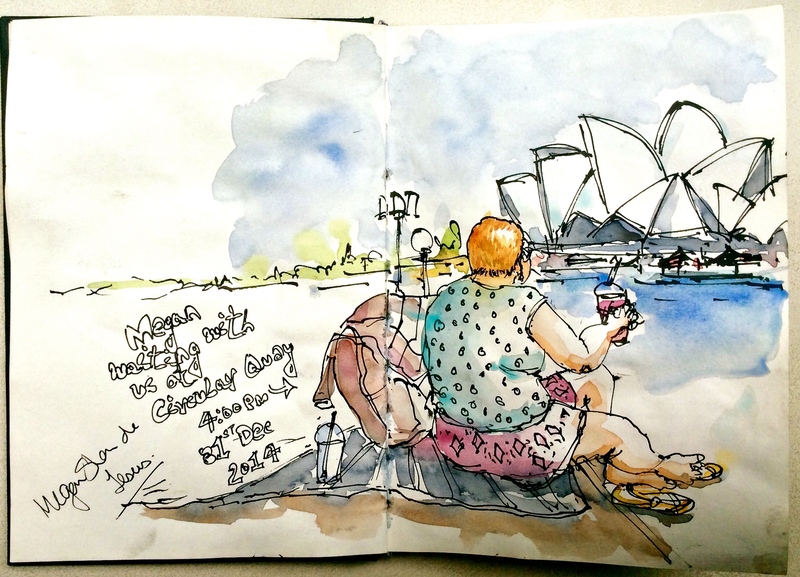 30th December 2014/ Sydney: I decided to sketch the opera house today because we didn’t know where we would be watching the fireworks from the next day and if I would even get this view or not. After the free walking tour of “The Rocks”, we bought a picnic mat and nibbles for the next day and had Fish and Chips dinner on our way back to George’s apartment. 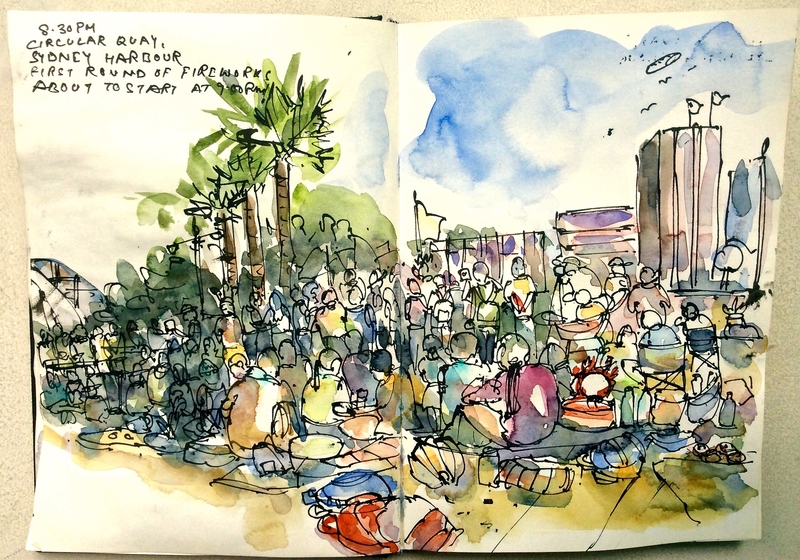 31st December 2014 : The Big Day – We were at Circular Quay at 10 in the morning. The Sydney New Year Eve official website listed several vantage points for watching the fireworks along with their maximum capacities. This place could hold 26,000 people. Of that, twenty six were already here, lying down on their picnic mats, rubbing sunblock. No alcohol or glass was permitted on the premises. 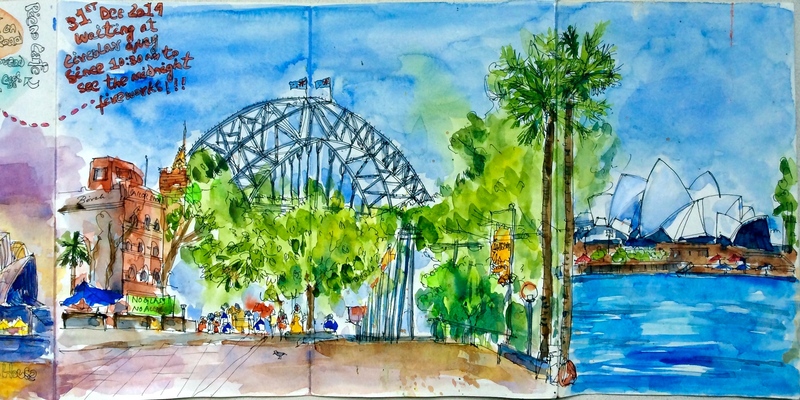 Upon finding a great spot** (after active debating), which meant unobstructed view of the Harbour Bridge and the Opera House, we settled down with our stash of nibbles under the hot sun to spend what was left of that year. 31st December 2014 / Sydney – After a hearty breakfast at Pieno Cafe on Crown Street, we walked to Circular Quay at around 10am to see if there’s empty space. There was. So we parked ourselves here till midnight. This was my view for the entire day. That’s when we saw our neighbours – Megan from Wales and her Portuguese husband Becas. They were back from New Zealand and ending their 25th anniversary celebratory tour with the Sydney fireworks. “How romantic”, we gushed and got talking. There’s only one way to describe the short haired, chubby cheeked Megan. She’s a veritable force of nature that overpowers anybody in her vicinity with love, vivacity, humour and charm. 31st Dec 2014, Sydney – This is Megan. Of course, I had to draw her. I also got her to sign my sketch. Notice her surname – ‘Jesus’! She has a big personality and a bigger heart that constantly expanded to accommodate more people. Megan took us under her wings and every other person who came over to sit near or around her – the Iraqi family from New York, the two pimply German guys who sang – ‘Deutschland über alles’ at every cue, the young Brit couple and the 20-something giggly selfie addicted Belgian girls. She would take turns to chat with each of us and every once in a while, call out a name and ask, “Are you okay?”. This is Circular Quay at about 4pm. People were pouring in from all directions and taking up any empty space available. All around, you could see bright ‘2015’ hats wiggling on heads, huge cameras and unwieldy tripods on standby for an event that was still 8 hours away. As Circular Quay started filling in, the member’s of the Megan club, huddled closer to each other, with its hawk eyed matron at the helm, guarding and protecting our space and precious view. No one could sneak in and block it, although many tried. The picnic mat became her ‘home’ and we were its members who were bound by its rules. Like chanting a Welsh rugby cheer every time Megan felt there was a slump in our energy levels. “Group hug, everyone”, she’d shout and make us stand. We’d feel silly but get up like obedient pupils. Thousands of revellers at Circular Quay would witness us huddled in a circle with arms around each other shouting at the top of our voices, following Megan’s lead. Megan : Oggy Oggy Oggy! Us : Oi Oi Oi! Megan : Oggy! ; Us : Oi! 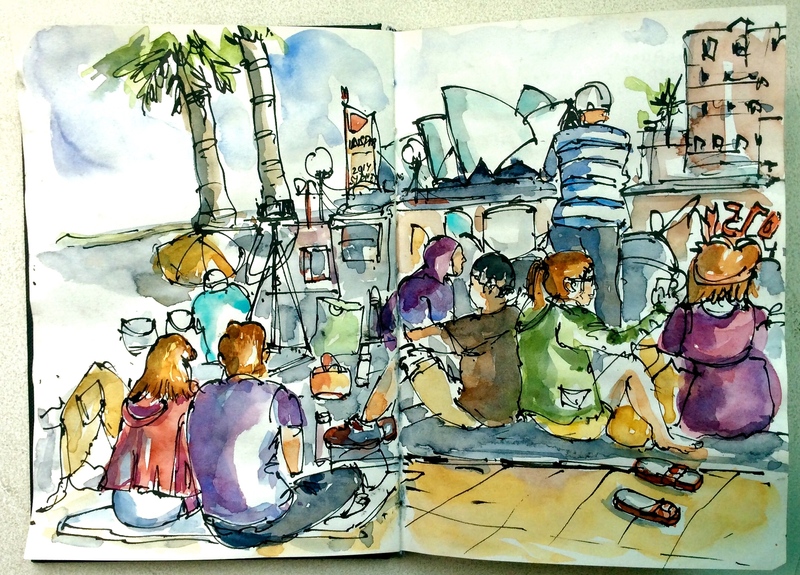 31st December / Sydney – This is how Circular Quay looked like at 8:30pm – sea of revellers from every country imaginable. It took my husband 45 mins to go through this crowd to the toilet stalls about 500 meters away and come back. “This place has reached its maximum capacity” was being continuously announced. 26000 people had gathered here to welcome the new year and I was one of them. And just like that, it was midnight. We watched the sky light up our faces in a million ways. This event was in our bucket list for years, at the centre of our itinerary, planned months in advance. It delivered what we’d hoped for, probably more and yet looking back it isn’t the spectacular fireworks that I remember from that day. It’s Megan, and her chants and her made up ‘home’ and ‘family’ that lasted for 14 blissful hours under a punishing sun. Such are the perks of travel. *Tips for finding an accommodation during Sydney NY fireworks – Unless you’ve booked your accommodation an year ahead to watch the inimitable Sydney fireworks, choices become very limited towards the end of the year. In such cases, book a budget friendly accommodation as close as you can get from the CBD, that offers free cancellation and check back again for better options say two weeks before the new year – you’ll most likely find a decent place. E.g – We used booking.com to block a cancellable hotel in Chatswood, 15 kms from CBD in October and Airbnb to find our accommodation in Surrey Hills, a 15 mins walk from CBD, in the last week of December. It is highly preferable that you stay within walking distance from CBD – you’ll thank yourself for this prudence when you look at the sea of revellers standing still outside train stations after the fireworks. Though I didn’t find a free spot, but university stays (http://www.universitystays.com.au/) could be an inexpensive and interesting lodging option in Sydney, specially during this time. Lastly, most places mandate a minimum stay of 3 nights – 30th Dec, to 1st Jan. So for easy availability, plan your stay accordingly. **Tips on finding a good spot to watch Sydney fireworks – Check the New Year’s Eve official website and scout some of the vantage points in person, a day before. Find a place with a good view of both the Opera House and Harbour Bridge. Bring food, drinks, picnic mat, umbrella, sunscreen and anything that will keep you occupied. There are spots that do not allow alcohol and glass – take note of that when choosing. Come early by 10, latest by afternoon. Take it easy, be prepared to spend the whole day. Lastly find Megan. She will get you through the wait. 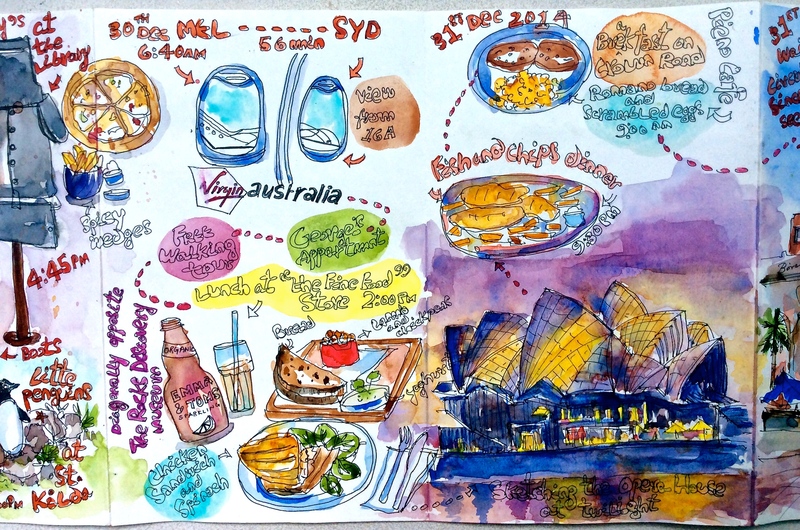 This entry was posted in Daily Vignettes, Travel Vignettes and tagged Airbnb, booking.com, CBD, Chatswood, Circular Quay, Crown Road, Crown Street, drawing, Harbour Bridge, I am free walking tours, illustration, Justine, Megan, New Year's Eve, Oggy Oggy Oggy, Pieno Cafe, QVB, rugby chant, Surrey Hills, Sydney, Sydney accommodation, Sydney Free walking tours, Sydney harbour bridge, Sydney New Year fireworks, Sydney Opera House, talking dog statue, The Fine Food Store, The Rocks, tips, Travel, urban sketching, Virgin Australia, Wales on February 13, 2015 by Somali Roy.